Saddlecloths have become increasingly popular on the racing memorabilia scene and Secretariat.com is proud to offer a very special version celebrating the mighty Meadow colt. The Official Limited Edition Secretariat Vintage Saddlecloth has been produced with a special thanks to jockey Ron Turcotte, who provided the original... the only race-worn saddlecloth featuring Secretariat's name. This same saddlecloth would again adorn the champion in his final public appearance, a special farewell ceremony held at Aqueduct racetrack on November 6, 1973. In the early '70s, it was nearly unheard of for a horse's name to be noted on a racing saddlecloth alongside the post position number. 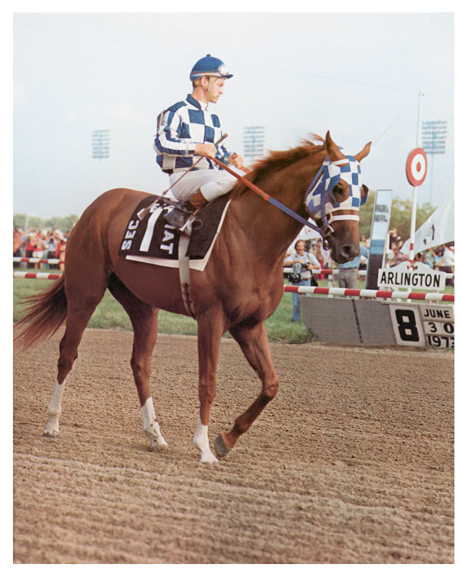 However, so great was Secretariat's popularity that Arlington Park provided the champion with a special saddlecloth featuring his name arched over his entry number 1 for the Arlington Invitational. 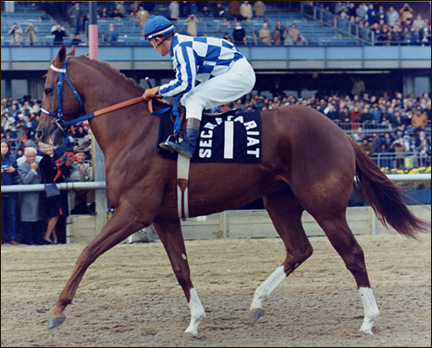 As history notes, Secretariat easily won the race, and jockey Ron Turcotte made sure to keep the distinctive cloth as a memento of the race. The saddlecloth was later brought out for the Aqueduct farewell appearance where the entire Meadow team joined an amazing 34,000 fans who showed up to tearfully say goodbye to the champion as he paraded down the stretch one last time. The Limited Edition Vintage Secretariat saddlecloth has been replicated in meticulous historical detail down to the last stitch. Each black twill cloth measures 37" x 36" and is individually hand-sewn featuring the number and block lettering on both sides. 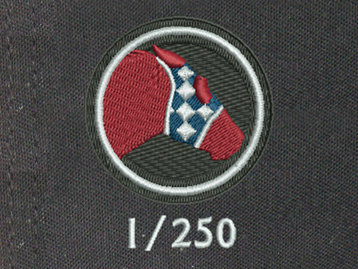 (For those with their own version of Secretariat in the barn, the saddlecloth is even ready to wear – a practical feature not typically found in the collectible arena.) The saddlecloths are strictly limited to a total of 250, each individually numbered in embroidery and are available with the option of being signed by Mr. Turcotte. As a complimentary bonus, all saddlecloth orders will be accompanied by your choice of 8" x 10" photo featuring Secretariat wearing the original - a retail value of $35! Additionally, we can provide classic shadowbox framing for a complete ready to hang display upon special request. A very special opportunity for the sports memorabilia collector or Secretariat enthusiast, order yours now.